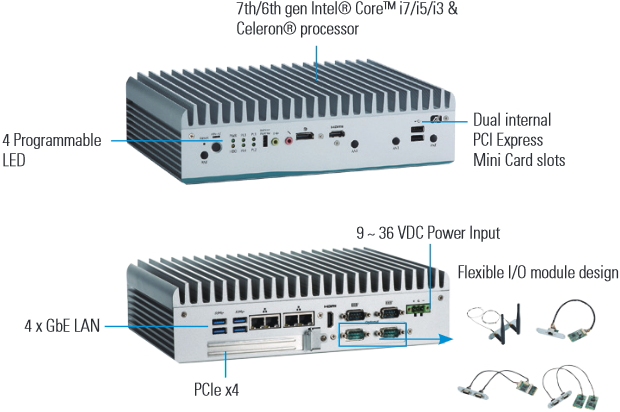 The eBOX700-891‑FL from Axiomtek, is a fanless embedded system with several expansion options. It reserves space to install an additional CAN or CANopen module. The embedded system supports dual DDR4-2133 SO-DIMM slots with up to 32 GiB system memory. This embedded box PC is suited for vision inspection (USB/PoE), motion control, security surveillance, and industrial automation. It is powered by the 7th generation Intel Core i7/i5/i3 and Celeron processors with the Intel H110 chipset. To reduce deployment time, the system reserves a space on its panel for customers to install an additional I/O module such as CAN and CANopen modules, for example. Integrated with an IP40-rated heavy-duty aluminum extrusion and steel case, it supports a 9-VDC to 36-VDC power input with power protection, an operating temperature range of -40 °C to +50 °C, and up to 3 G vibration endurance to withstand harsh environments. The box PC comes with I/O interfaces including two EIA-232/422/485 ports, four USB 3.0 ports, two USB 2.0 ports, four GbE LAN ports, two HDMI ports, one Displayport, and one audio (Mic-in/Line-out). It also features a AT/ATX DIP switch for adjustments between automatic and manual operation control. Furthermore, the embedded PC comes with expansion capabilities including two PCI Express Mini Card slots, one SIM slot, and one PCIe x4 slot. For storage needs, it is equipped with one 2,5-inch SSD/HDD and one optional mSATA interface. The embedded system supports Windows 10 IoT and Linux. To meet different application needs, it can be wall-mounted or DIN‑rail mounted upon request. "The eBOX700-891‑FL is designed with user-friendliness in mind. Its heatsink top cover can simply be opened by unfastening the four screws for the access to the processor and DRAM. Moreover, its bottom cover adopts a convenient flip lid design along with easy-to-access brackets for securing the USB dongle and hard drive," said Janney Lee, product manager of Product PM Division at Axiomtek. "Axiomtek has obtained patents, No. M511183 and No. M531115, for the special chassis design of the eBOX700‑891-FL. Easy maintenance is one of the advantages we are offering to our customers and one of the main focuses of our product development. We will continue pursuing excellence and innovation in design and manufacturing."